We have some difficult news to share with everyone today. Unfortunately due to declining interest, Millwill Furnishers are no longer going to be selling (and purchasing) used / second-hand furniture from Saturday 14th of April. This means we will also no longer be purchasing used furniture items from customers. We would like to thank everyone who has previously purchased used furniture from Millwill Furnishers, and hope the quality of service you received inspires you to still pop in when looking for brand new furniture, carpets and vinyl flooring, which we will be continuing to stock as normal. 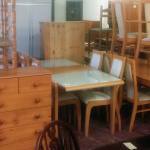 Plus, we have an astounding selection of our remaining used furniture items still available to buy. We are more than happy to provide further information regarding this unfortunate news. Please feel free to contact us via 01733 553 565 or by sending us a message using our online contact form.